When I first began to plan the details of our courthouse wedding I started a "secret board" on Pinterest, which you can now see here. 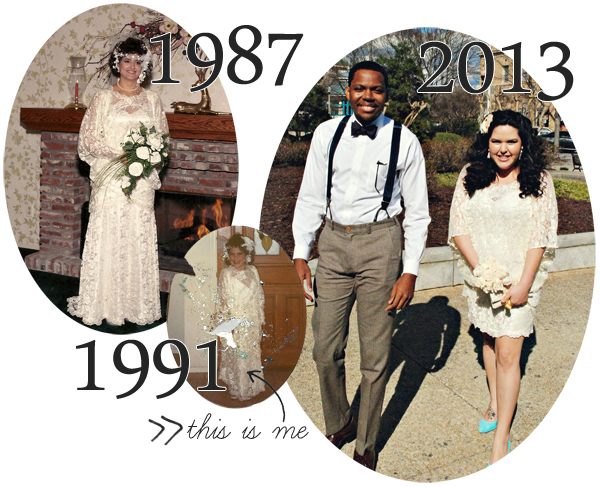 From the very beginning I knew I wanted to wear a short lace slip dress. I wanted a dress that was classy but less formal than a full wedding gown and was drawn to dresses like this beautiful, vintage-inspired dress found on Etsy. But, being on a shoestring budget meant shopping around for the perfect price point. In discussing our plans with my mom I shared photos of details I'd pinned to give her an idea of what I was going for. Later that day she came to me with her wedding dress and a proposal. What did I think of wearing it on my own special day? My mom is incredibly talented and offered to alter it for me. Now, at the time this happened, I was about 8.5 months pregnant with a huge stomach. I couldn't fully try on the dress but somehow how I knew it would be perfect! 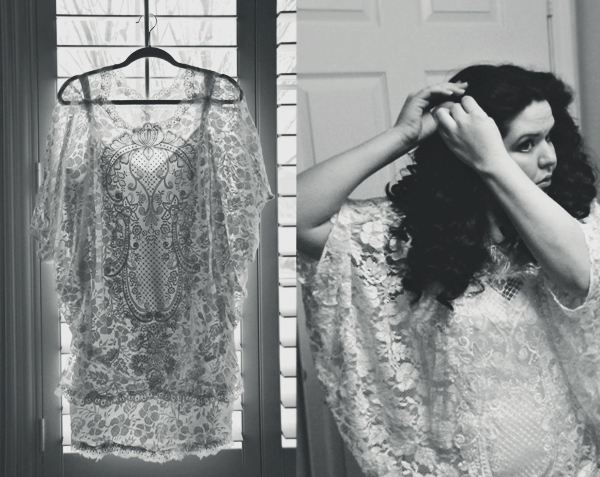 The vintage lace is gorgeous and I thought the cut would be flattering on me. Fast forward to the middle of January. I was about 8 weeks postpartum and although I had pretty much reached my pre-baby weight I wasn't true to my previous size. That's when my mom stepped in with her magical ways. She completely rebuilt the slip by taking it out and bringing the bottom up. I felt conflicted about making the dress short because it was so beautiful long but in the end we stuck to the original plan. She took the bottom of the dress completely off to create a short, straight skirt and added the original bottom lace to the end of it. I loved the big bolero style sleeves but thought we could bring it up to date by having them end after the elbow instead of keeping them long so that's what she did. In the end I could not be happier with the way it turned out. It's even better than I had originally envisioned and I love that it was hers! A funny little back story on this dress. As you can see in the collage above, this wasn't my first time wearing my mom's dress. In 1991, when I was 8 years old, I wore this dress for Halloween! Ha! That year I entered into a costume contest at our after-school care Halloween party and won 1st place for Most Beautiful Costume. How sweet is that?! You can see more photos of my dress in our professional wedding photos here, here, and here. XOXO I love this post. It was such a blessing to be able to do this and I am so very happy that you loved it! You sure looked beautiful in it!